The journal-brief package is now available in Fedora (22+)! For more about journal-brief visit the GitHub page. It’s pretty easy to see what error messages have been logged on a machine with systemd installed: just run journalctl -p err. But this will show you all of the messages of priority “err” or higher, starting from the beginning of the log. What if you only want the most recent ones? Again, that’s pretty easy: journalctl -p err -e will do it. The -e parameter tells it to start at the end, not the beginning. But what if you specifically want to know about error messages that have been logged since you last looked? Enter journal-brief, which keeps a bookmark so that it will only show you messages logged since you last ran it. Here is a recipe for using encrypted boot on a Fedora Server system that does not have a monitor or keyboard attached during normal use. I’ll use Fedora 21 Server, and will have a dedicated encrypted volume group for data but leave the main operating system volume group unencrypted. The encryption key will be stored on a USB memory stick. When it is connected the system will boot normally; otherwise it will wait for a while for it to be connected and finally fall back to emergency mode. Patchutils now lives here. That is all. 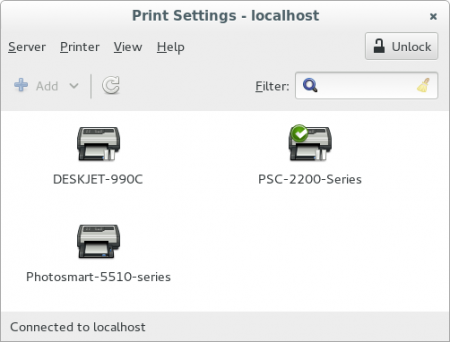 The latest version of system-config-printer adds a new button to the main screen: Unlock. This is a GtkLockButton attached to the “all-edit” polkit permission for cups-pk-helper. The idea is to make it work a bit more like the Printing screen in the GNOME Settings application. To make any changes you need to click Unlock first, and this fetches all the permissions you need in order to make any changes. You are currently browsing the archives for the Techie stuff category.